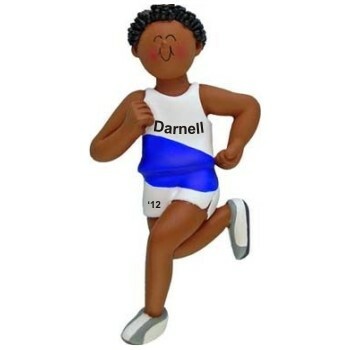 If you're guy can really fly, then celebrate his short-distance speed or long-distance endurance with the African American male runner personalized Christmas ornament. These well-designed sports ornaments personalized to be special mementos include a display cord and our custom velvet gift bag. You'll find many other wonderful African American ornaments for any occasion in our collection. The male runner personalized Christmas ornament is available in Caucasian styles too for having one made for each member of the team. Each one is hand lettered with the custom information you provide.